The first of The Voice Kids Philippines Grand Champion, Lyca Gairanod has been dominating the scene from TV guestings, TV series, TV programs and malls shows. From May 24-July 27 of this year, Lyca reign the top competition of The Voice Kids Ph under Team Sarah Geronimo, until she was announced as the grand winner. Family and friends of Lyca are very proud of what the little superstar has achieved and now one of the grand prize will be given to her formally, a house and lot from Camella Homes. 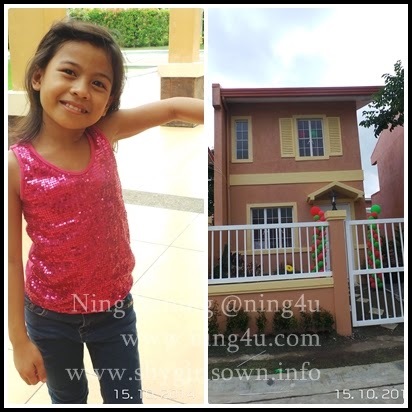 The house & lot turnover happen at Tierra Nevada, Camella Homes, General Trias, Cavite. Together with Lyca's dearest family, they accepted the key of their new home and immediately open the door.The smile on their faces are immeasurable. Lyca even roam around the house and even hug the furniture inside. "Napakasaya po namin ng pamilya ko kasi meron na kaming sariling bahay at may second floor pa kami, magkakasya na kaming lahat dito at may magaganda pa kaming gamit kagaya ng ref at lutuan" Lyca said. I asked Lyca what is the next things she needs to purchase or invest on and she said "Pinag-iipunan po namin ang sasakyan, kasi para po pag-may trabaho hindi na kami mahihirapan, kahit simpleng sasakyan lang po basta kasya kaming lahat din pag mamasyal." The Gairanod family which is also based in Cavite, specifically in Tanza is happy and proud to have their very own house & lot near to their friends. This time they will not be renting or pay monthly, just to have a peaceful home. Lyca and her family can sleep and energized completely in order to prepare for the next challenges of life. A place that she can call home, a place where she can sing, dance and enjoy with her family.